Glee has put show choirs in the national consciousness, but have you ever wished that it contained a little more humor and the occasional murder? Enter Murder for Choir, written by mystery author and performer Joelle Charbonneau. Paige Marshall has been fairly well-reviewed as an opera singer, but her reluctance to leverage connections to get new jobs has seriously hurt her career. She should be heading to New York or touring Europe with her skills, but instead she is stuck back in the suburbs of Chicago, living with her eccentric aunt, Millie. She even has a new job, coaching the top show choir at Prospect Glen High School. This is decidedly not what Paige wants from life — she has no real interest in teaching, and the kind of music sung by show choirs isn’t really her thing. Plus, the whole dancing thing is not a strength of hers — there’s a reason she’s in opera, not on Broadway. The beginning of choir camp, with four area high schools, is fairly painful — most of Paige’s new students seem to have little or no faith in her, and she’s not really sure how to assert her authority. It is the second morning of choir camp, though, when things get really bad. Paige walks into Prospect Glen’s auditorium looking for her boss when she finds Greg Lucas, the much-reviled choir director of North Shore High, dead at the piano, strangled to death with a microphone cord. Not only is Paige questioned in his death, thanks to her run-in with him the day before his murder, but one of the students in her choir is now the prime suspect. Paige is certain of her student’s innocence and is determined to solve the mystery of Greg’s death and clear his name. Paige’s investigation brings her in contact with two handsome men, both of whom seem to be flirting with her — even if one of them is allegedly gay. Just when she thinks things couldn’t possibly be more complicated, she begins getting too close to the murderer and finds herself in danger as well. 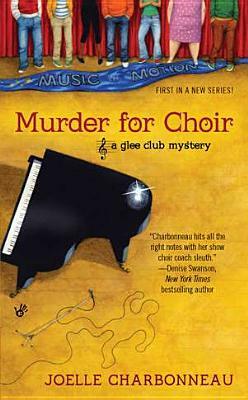 Murder for Choir is the first book in Joelle Charbonneau’s new Glee Club cozy mystery series. Charbonneau is already well-regarded as the author of light and funny mysteries with her Rebecca Robbins series, Skating Around the Law and Skating Over the Line, and Murder for Choir is just as much fun. Paige Marshall is a very engaging main character, she is a realistic woman, simultaneously strong and unsure of what she wants to do with her life. Charbonneau’s supporting characters are just as vivid, particularly the extremely eccentric Aunt Millie, who adds some much-appreciated comic relief. If you’re looking for a fun new cozy mystery series, Murder for Choir would make a wonderful addition to your summer reading list.